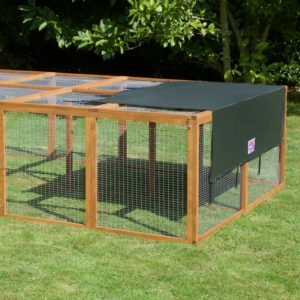 Guinea pig runs are the best way for owners to give their pigs a safe pace to play and exercise. Our runs come in all shapes and sizes so you can find the perfect option for your needs. 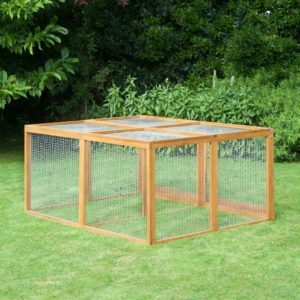 We also provide all the run accessories you could ever need including toys and boredom busters, run shelters, run shades and food and water dispensers. 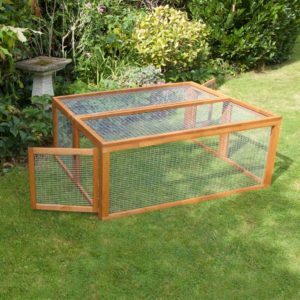 Many of our runs are also designed to attach to our guinea pig hutches which means you can make them a permanent or temporary addition to a hutch without a minimal effort. 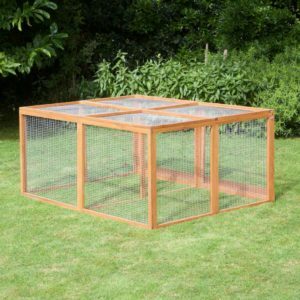 Here at Home & Roost, we love guinea pigs as much as you do. 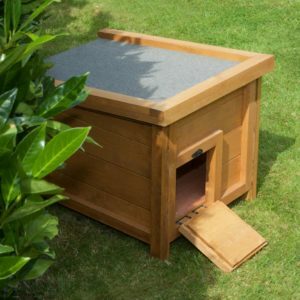 That is why we have made sure that every run we sell is designed with your pets in mind. 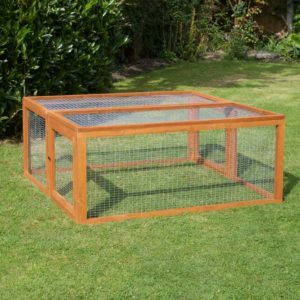 All of our runs use 1 inch by .5 inch galvanised wire mesh to keep them safe from predators without risking them getting caught. 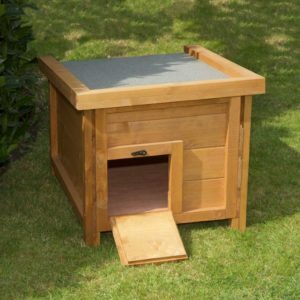 The wood we use is also treated with water based pet safe wood preservative. That way even if your pet nibbles their new run they will be just fine. We have even considered the height of our runs. 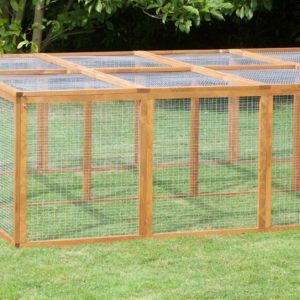 They are all designed with approximately 2 feet of head room so your guinea pig can stand up on its hind legs without hitting its head. 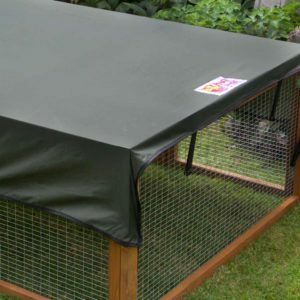 If you are considering buying a run, we recommend you purchase a few other accessories to keep your guinea pig protected. First of all we would suggest a run shade. 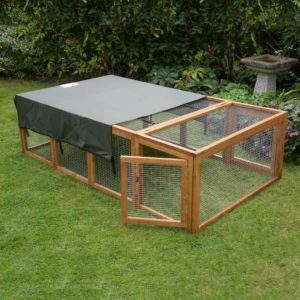 Guinea pigs are not used to being out in hot weather or direct sun so they will need a shady place to relax. The shade will also help them stay dry if it rains. Another good addition to your run is a few toys. Guinea pigs can get bored if they are just left alone with nothing to do and toys really help. 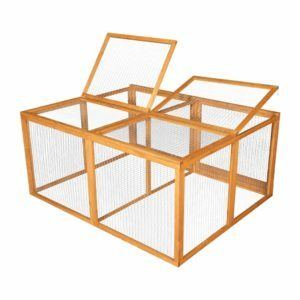 We carry both standard and folding guinea pig runs. All of our runs can easily be moved around by two people. That means you can change the location of your run to give your guinea pig a new place to explore. Our folding runs are another great option. 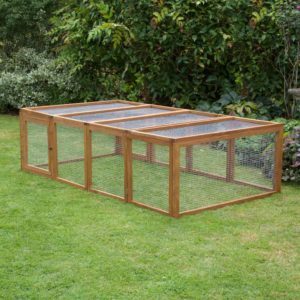 They can be put away for winter and are perfect for small gardens where a more permanent run is not an option.